Tanks had made their first appearance in September 1916 during the Battle of the Somme. Although they had some notable local effects, in many ways their performance was disappointing, proving to be unreliable mechanically, prone to ditching and vulnerable to artillery fire. 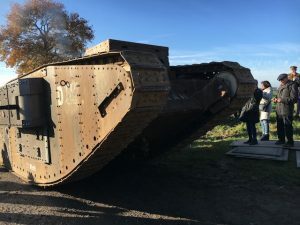 Tanks were used again during the Battle of Arras in April and May 1917 and a new model, the Mark IV was used in the Battle of Messines and The Third Battle of Ypres (Passchendaele) later in the same year. When used on unsuitable ground, such as in mud or ground pitted by shell holes, tanks proved ineffective. However, tanks did enjoy some success in dealing with enemy strong points when used on suitable firm ground. The major British battle of 1917 was The Third Battle of Ypres (Passchendaele), during which there were over 250,000 British casualties. Yet, as The Third Battle of Ypres was winding down, Haig was already planning another assault against the Germans. This was to take place in front of the town of Cambrai, by the British Third Army under its new commander, Sir Julian Byng. The German army had been put under massive strain at Ypres and Haig was convinced that Germany was coming to the end of its ability to carry on the war; further blows against the German Army might end the war before the end of the year. He was also anxious for a victory before the end of the year to silence the growing criticism of his strategy on The Western Front. The Battle of Cambrai is usually remembered as the battle in which tanks were used in large numbers for the first time. Brigadier-General Hugh Elles of the Tank Corps was keen to use tanks in large numbers on suitable ground. The British Third Army in front of Cambrai faced the formidable defences of the Hindenburg Line, but the ground here was firm and, as there had not previously been a major offensive, not pitted with shell holes. 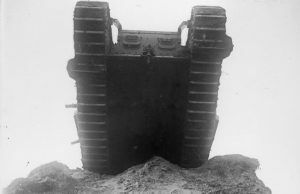 However, much of the British success on the first day of The Battle of Cambrai is explained by the use of innovations other than the tank. A major problem of any large scale offensive on the Western Front was the inability to achieve surprise; attacks were preceded by long artillery bombardments which were essential to cut the belts of barbed wire in front of the enemy trenches. The plan at Cambrai was to attack without any preliminary bombardment. New techniques allowed the British artillery to open fire on German positions as the attack began. Tanks were largely used to flatten the barbed wire, particularly in front of the formidable Hindenburg line. The attack was to be on a six and a half mile front and was to be carried out by six infantry divisions supported by nine tank battalions, numbering over 430 tanks. The artillery barrage was provided by over 1000 guns and five cavalry divisions were available to exploit any breakthrough. Preparations were carried out in great secrecy, with tanks and guns brought up at night and heavily camouflaged or hidden in woods and buildings. The aims of the offensive were to break through the Hindenburg Line, take the high ground around Bourlon Wood, isolate Cambrai and advance behind the German lines to the North. The plan was very ambitious for the resources available as there were very limited reserve forces to follow up any initial success; most of the Third Army was recovering after involvement in the Third Battle of Ypres. On the opening day of the attack, 20 November 1917, the British gains of over four miles with low casualties were spectacular by the standards of World War 1; as much ground was gained in twelve hours than in over three months in The Third Battle of Ypres. It was the only occasion on which church bells were rung in Britain to celebrate a victory. Despite the successes, there were some disappointments, such as the failure to take Flesquières and the failure to capture an intact bridge over the canal at Masnières. There were further gains on 21 and 22 November, but German resistance was increasing and the British were facing increasing numbers of counter-attacks. Haig urged Byng to focus on securing Bourlon Wood, which dominated the surrounding area. The Wood was captured, but retaken by the Germans. As the fighting around Bourlon Wood continued, the Germans were planning a major counter-attack. Revolution in Russia meant that she was no longer playing an active part in the war and the Germans were able to begin the process of bringing hundreds of thousands of troops to The Western Front from the East. The British were now within a salient (a bulge in the line) which they had punched into the German positions: it was as if British forces were inside a sack. On 30 November, the Germans launched an attack which largely took the British by surprise. Employing new infiltration tactics, a short, intense bombardment was followed by groups of storm troopers moving forward, by-passing strong points which were then left for following troops and artillery to deal with. Attacks were made on the salient from the North and South which were aimed at cutting off British forces inside it. There was determined resistance in the North, often by mixed forces, including infantry, dismounted cavalry, engineers and Labour Corps. Many German attacks were broken up by artillery. The strongest attacks were in the South towards Gouzeaucourt, which fell to the Germans on the first day. A counter-attack by the Guards retook the village and a further attack on 1 December by the Guards and cavalry stabilised the situation. British losses mounted as German attacks continued and Haig ordered Byng to withdraw to a more easily defensible line. This withdrawal was completed by 6 December. British losses were about 44,000 men, including prisoners. German losses were something similar. The Battle of Cambrai had failed in its objectives and virtually all of the ground gained in the early stages was lost. 11,000 German prisoners had been taken, but the Germans had taken 6,000 British prisoners. The major consequences of Cambrai for the conduct of the war were political. As the German counter-attacks wiped out the early successes, the mood at home in the press and amongst politicians became one of anger. The Prime Minister, Lloyd George, had little faith in Haig following the casualties of the Somme and Passchendaele, and Cambrai made the gulf between Haig and the government even greater. More anger was caused by a report by Byng which concluded that no blame for the failure at Cambrai could be placed against senior commanders and that it was solely due to inadequate training amongst junior officers, NCOs and the men. Haig was not removed, though he believed that this might happen. However, the senior staff officers around Haig, who were believed to be too anxious to carry out his bidding, were removed. The Government also began to limit the number of men available to Haig in an effort to prevent him launching further large offensives in 1918, which had major consequences when the Germans launched the first of their major offensives in the Spring. There were eventually five British armies in France. Each comprised of 250,000 to 500,000 men and was commanded by a full general. For administrative reasons armies were divided into three to five Corps, commanded by a Lieutenant General. This was the largest formation which normally remained together. At full strength a division would number 20,000 men, commanded by a Major General. The Division was self contained. It was made up of twelve infantry battalions and also included a range of other units such as artillery, the medical corps, transport, engineers and a veterinary section. A thirteenth pioneer battalion was added to carry out tasks such as trench digging and building work. Divisions were divided into three Brigades. Each Brigade was made up of four battalions and was commanded by a Brigadier General. The battalion was the basic unit of the infantry of the British army in The First World War. At full establishment, it consisted of just over 1000 men, of whom 30 were officers. Men in a battalion would all be from one regiment, e.g. The First Battalion of The Lancashire Fusiliers. Men in a battalion remained together as a group during the war. The battalion was usually commanded by an officer with the rank of Lieutenant-Colonel. A Major was Second-in-Command. The battalion headquarters included a range of officers, NCOs and privates responsible for administration, stores, transport, signals, medical care and a range of other duties. A battalion was divided into four companies, usually lettered A to D or in the case of the Guards Regiments numbered 1 to 4. Each of the 4 Companies numbered 227 men at full establishment. Each was commanded by a Major or Captain, with a Captain as Second-in-Command. The company was divided into 4 Platoons of about 45 men, each of which was commanded by a subaltern (a Lieutenant or Second Lieutenant). Each Platoon was subdivided into 4 Sections, each of about 12 men under an NCO. The tank service was originally named the Heavy Section Machine Gun Corps, with tanks organised in companies. Each company was designated by a letter and each tank was numbered and given a name which began with the letter of the Battalion. The names of tanks in F Company included Fearless, Flying Fox, Ferocious and Fighting Mac. From November 1916 tanks were organised in Battalions. Although each battalion received a number, the system of lettering was also retained for naming each tank. A Battalion consisted of 3 Companies, each of which had 12 tanks. Each company was further divided into 4 sections of three tanks. Each battalion, therefore, comprised of 36 tanks. Mobile workshops provided the engineering back-up to service the tanks. In July 1917 the Heavy Branch of the Machine Gun Corps became the Tank Corps. Each Tank Battalion had a complement of 32 officers and 374 men. The commander of The Tank Corps in France and Belgium was Brigadier General Hugh Elles. An enormous amount has been written about the causes of the war and the general opinion of historians has changed greatly during the period since 1918. The opinion of the Allies as the war ended was very clear. Germany was required to accept responsibility for the war in the Versailles Peace Treaty, was forced to sign the “War Guilt Clause” and forced to pay reparations for the extensive destruction caused in France and Belgium during the four years of fighting. However, from the 1920s and 1930s onwards, attitudes began to change and the war was seen as a tragedy into which Europe had fallen, caused by factors in which all countries could be seen to bear some of the blame. But from the 1960s onwards, this view was challenged and many modern historians now see the ambitions and actions of Germany as the major factor in the outbreak of war in 1914. This is a subject which will undoubtedly continue to be discussed and written about for many years to come. Unrest in the Balkans, the area of Southern Europe between the Adriatic Sea and Black Sea, played a key role in the outbreak of war. It was in this region that the incident leading to the outbreak of war, the assassination of Austrian Archduke Franz Ferdinand and his wife, took place on 28 June 1914. For centuries this area had been part of the Turkish Empire, but, as Turkey’s power declined, national groups broke away and formed new countries to govern themselves. This process was encouraged by Russia as a means of increasing her influence in the area and new countries such as Serbia looked to the Russian Empire for support. However, the ambitions of new Balkan states, particularly Serbia, were seen by the Austrian Empire as a direct threat. The Austrian Empire was made up of a patchwork of different nationalities and included modern day Hungary, the Czech Republic, Slovakia, parts of Poland and parts of Serbia. These peoples were also beginning to demand the right to govern themselves and this threatened to tear the Austrian Empire apart. Austria was determined to remove the threat of Serbia and the assassination of Franz Ferdinand by a member of a Serbian terrorist group gave Austria a justification to attack. However, the crisis which arose from the assassination could not be kept local within the Balkans as the European powers were tied together in a series of alliances. These alliances have been seen as a key factor which resulted in the assassination dragging all of Europe into war. Germany had an alliance with Austria and Italy, this group often being referred to as the Triple Alliance. France had an alliance with Russia and, although Britain was not formally part of this alliance, she developed close relations with these two countries from about 1900 onwards; this group is often referred to as the Triple Entente. After the assassination of Archduke Franz Ferdinand, Austria was determined to attack Serbia while Russia was determined to support Serbia. Because of her alliance with Austria, Germany would be required to intervene to support Austria against Russia, which would then involve France who was bound by alliance to support Russia. The alliance systems also bred mistrust and fear and each country had built up large armies. Austria was not the only country in Europe bearing a grievance, however. The German Empire had been established in 1871, but Germany had come into being at France’s expense, following the decisive defeat of France in The Franco-Prussian War of 1870-1871. The creation of the new German Empire was declared in Versailles in 1871 while Paris was under siege. France was further humiliated by being forced to hand over the provinces of Alsace and Lorraine to Germany as part of the peace treaty which ended the war. A movement seeking “revanche” (revenge) established itself in France, though its influence prior to 1914 was limited. Although each of the Great Powers in Europe had grievances which help to explain the outbreak of war in 1914, modern historians have focused more and more on the role of Germany. After 1871, Germany became a major world industrial power rivalling Great Britain. Yet many leading figures in Germany believed that their country was being denied the position in the world that she deserved as a result of her industrial strength. Furthermore, it was believed that Germany was being “surrounded” by Britain, France and Russia and being denied the position that she deserved in Europe. Germany began to seek colonies overseas and began a programme of naval expansion, which was clearly intended as a challenge to Britain. Britain drew closer to France and Russia and also began to increase the strength of her own navy. The launch of HMS Dreadnought introduced a new class of warship and sparked an arms race at sea as Germany responded with her own new warships. There was a belief held by some leading figures in the German military and government that war was inevitable and Germany’s actions in 1914 were important in driving Europe towards armed conflict. Rather than restraining Austria following the assassination in Sarajevo, Germany encouraged action against Serbia. It was not inevitable that France be drawn into the war, but Germany’s only plan for war involved attacking France and this attack was to include the invasion of neutral Belgium. This attack took place on 3 August and was undoubtedly the decisive factor in support for the war amongst public opinion in Britain. However, between November 1914 and March 1918, the war on the Western Front was one of deadlock. Fighting took place between two sides occupying lines of opposing trenches which never moved more than a few miles and stretched from the Channel coast, through Belgium and France to the Swiss frontier. It was here on the Western Front that the outcome of the war was to be decided; each side knew it had to win here or lose the war. If this situation was not planned for, why did it arise?